This is a perfect healthy breakfast recipe to accompany you and your coffee on the weekend! This pumpkin bake is light and fluffy and full of flavor. I topped mine off with chocolate chips and sprinkled a few oats on top to toast while in the oven. 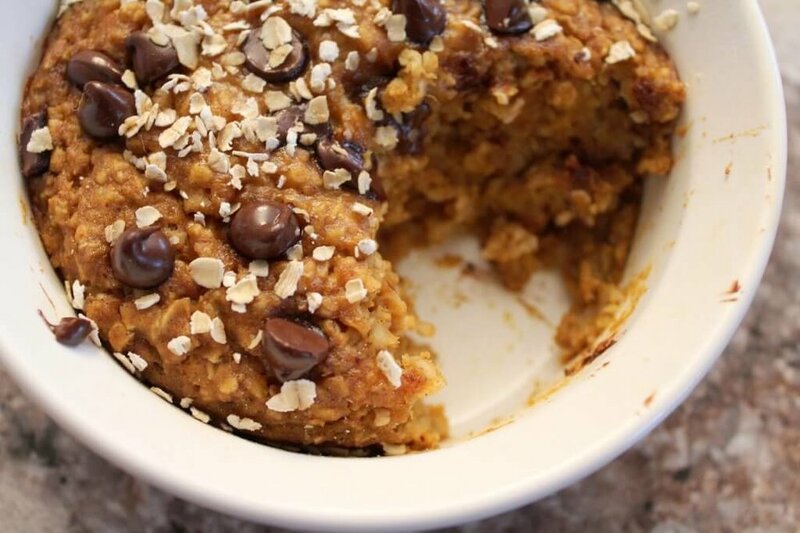 Don't limit this little pumpkin bake to breakfast! Add chocolate chips and a scoop of frozen yogurt and call it a healthy dessert! Preheat oven to 350 degrees. Combine oatmeal, cinnamon, pumpkin pie spice, and baking powder in a small bowl. In a separate bowl combine brown sugar, honey, milk, pumpkin, egg white, and vanilla. Mix the dry and wet ingredients together and pour batter into a greased oven safe personal ramekin. Bake for 25-30 minutes, or until oatmeal is set. Remove from oven and top oatmeal bake with nuts, fruit, vanilla Greek yogurt, or chocolate chips. Enjoy!